Deviled egg potato salad with salmon, dill and spring onions, a recipe to please a crowd. Great choice for Easter, or any party, picnic or family gathering. Easy to put together, gone from the plate in seconds. 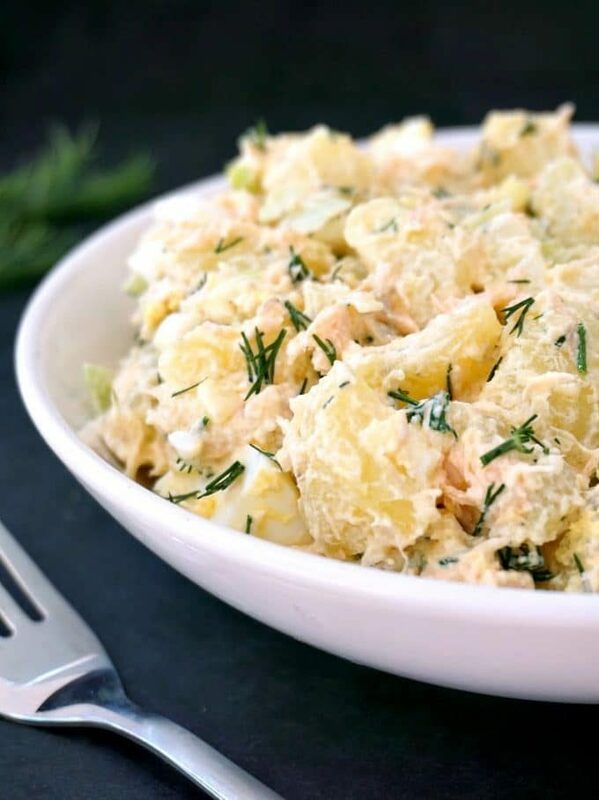 A nice potato salad has always topped my list of all time favourite dishes. I’m absolutely crazy about potatoes, cooked in any possible way, served any time of the day. Deviled eggs are another popular recipe with my family. They make a great bite for any party or celebration, and they usually make me think of Easter and sunny days. Now, combine these two superlicious dishes: potatoes and deviled eggs, and you get the salad of all salads: the one and only deviled egg potato salad. But wait! There is more goodness coming your way! Throw in some baked salmon, with all its healthy kind of fat, and you are in for the best dish ever. Still not sold yet? Well, let’s just make it even more interesting. Cut the amount of mayo by half, add some plain yogurt, a bit of dill and spring onions, and there you have it. 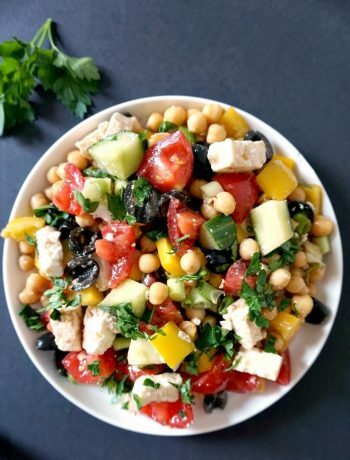 Forget about store-bought salads drenched in heavy dressing, this homemade salad is the best you can every get. How do you make deviled egg potato salad with salmon? Now, there are two ways of cooking the potatoes: either boil them in their skin, or peel it off, cube them, and then boil them. If you go by the first method, the cooking time is a bit longer. But it’s the way I highly recommend. When you boil the potatoes in their skin, they are less breakable and mushy, and can hold their shape better in the salad. The salmon can either be baked, or pan-fried. I chose baking, but you can do either way. Make sure the potatoes, hard boiled eggs and salmon are cooled down before adding the mayo and yogurt. The vinegar brings a bit of sharpness which contrasts beautifully with the mayo, and the dill and spring onions bring freshness and colour. 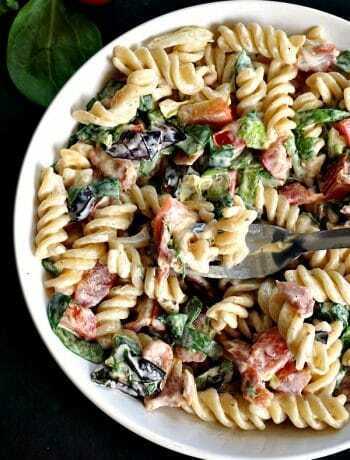 And all there is left is giving a good mix, leaving the salad to chill for a bit in the fridge, and that’s it, a salad to die for. Can you make deviled egg potato salad in advance? 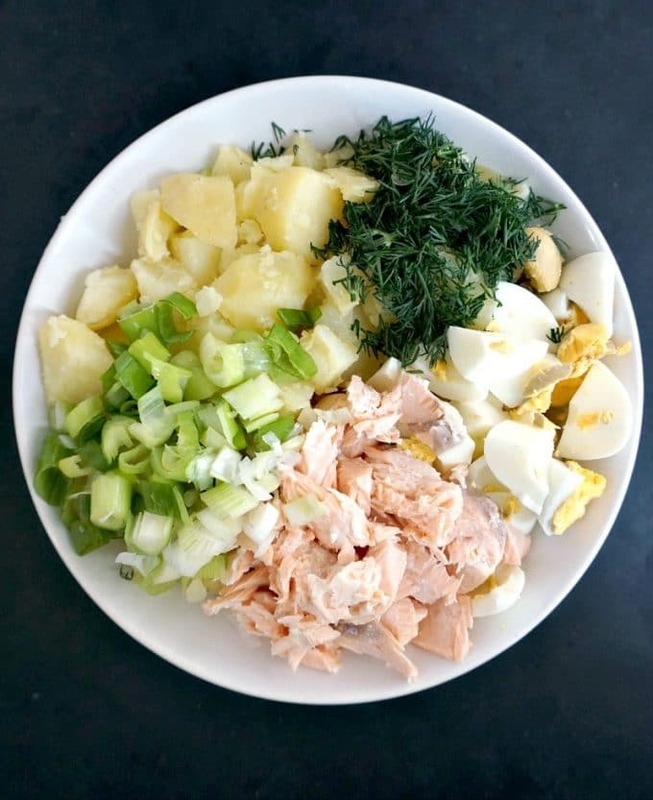 If you have to make the salad in advance, I would just boil the potatoes and eggs, and bake the salmon, and don’t prepare the salad until you are ready to serve it. Just keep everything in the fridge, so they can be already cold, and then mix in the yogurt, mayo, oil and vinegar before serving. The salad can be stored in the fridge overnight, but I wouldn’t leave it in there for longer than a day, maximum two. I’m a bit paranoid with leaving food around for too long, even if it’s in the fridge. I absolutely dread food poisoning, and prefer to clear the food from the fridge sooner rather than later. If you’ve liked my DEVILED EGG POTATO SALAD or any other recipe on the blog then don’t forget to rate the recipe and let me know how you got on in the comments below, I love hearing from you! You can also FOLLOW ME on FACEBOOK, and PINTEREST to see more delicious food and what I’m getting up to. 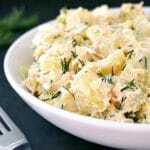 Deviled egg potato salad with salmon, dill and spring onions, a recipe to please a crowd. Great choice for any party, picnic or just a day to day treat. Easy to put together, gone from the plate in seconds. Place the potatoes in a large pan and cover with plenty of water. Add some salt to the water and boil on a medium to high heat until tender, this might take about 20-30 minutes depending on the potatoes. Preheat the oven to 200 degrees Celsius (390 Fahrenheit), cover the salmon in kitcken foil and bake for 15 minutes until cooked through. In a separate pan, boil the eggs for at least 15 minutes until hard. You can also boil the eggs in the same pan with the potatoes, if you wish. Drain the water and leave them to cool. Peel the potatoes and cut them in half, the eggs can be either sliced or cubed. 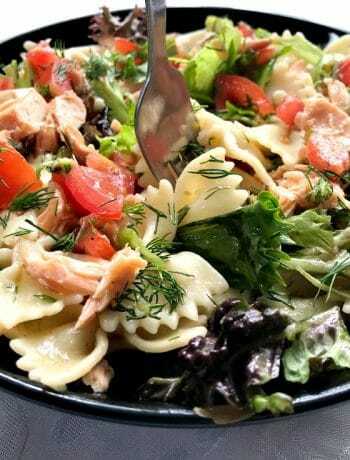 Flake the salmon filets and add them to a bowl together with the potatoes and eggs. Chop the spring onions and dill and add them to same bowl. Season with salt and ground black pepper and drizzle some extra virgin olive oil and vinegar over. Add the natural yogurt, mayo and mustard and mix well. Multumesc! A fost tare gustoasa. Thank you very much, this is by far my favourite salad ?